As an application that leverages all the agility and reach that the cloud provides, we thought it only appropriate that Lombardi Blueprint help sponsor Cloud Camp Austin 2009. 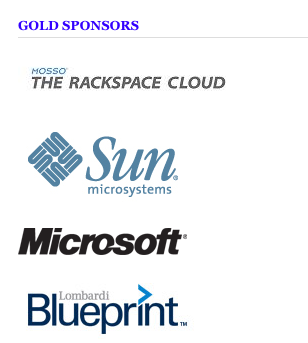 Along with lesser known companies like Microsoft, Sun and Rackspace, Lombardi Blueprint is a gold sponsor of the event (actually since I took the screenshot to the left, Aserver, Rightscale and Zeus have also joined the golden ranks). As a gold sponsor we get to deliver a 5-7 minute lightening talk at the beginning of the event. The only restrictions are that it be cloud related and it can’t be a product pitch. I will be talking about the cloud and democratization of information. CloudCamp is an unconference where early adopters of Cloud Computing technologies exchange ideas. With the rapid change occurring in the industry, we need a place we can meet to share our experiences, challenges and solutions. At CloudCamp, you are encouraged you to share your thoughts in several open discussions, as we strive for the advancement of Cloud Computing. End users, IT professionals and vendors are all encouraged to participate. The cost of the event is FREE and all you need to do is register online so they know how many folks are coming (heck, I bet if you showed up that day they probably wouldn’t turn you away.) So come on down next Saturday and enjoy and learn. And remember, since its an unconference that means anyone can propose and lead a session and we all learn from each other. This entry was posted on Thursday, April 16th, 2009 at 8:12 pm and is filed under Uncategorized. You can follow any responses to this entry through the RSS 2.0 feed. You can leave a response, or trackback from your own site.